Well here is my chocolate cherry cake on display at Sandra V’s. The display will be up until Mothers Day – 12th May for those who have forgotten. I really like my cake in a window, and have a vision that one day I’ll have a huge chocolate window display with some really cool cakes, and sculptures. The ones where it makes kids and adults alike stop and stare. Until then…..
– Mix all together and put in tupperware type of cereal container. – You can add milk, or have it with yoghurt and add fresh fruit if you wish. It’s important to have a balanced diet with plenty of exercise, so even though I make these big chocolate cakes, which my family do on occasion get to sample or have their own, we as a family like to eat healthy and keep active. For example, my husband runs marathons & ultra marathons, my eldest plays tennis, my youngest runs everywhere!! And I do my long distance walking. We allow ourselves some junk food, but the majority of the time it’s pretty healthy. I also make my own sauces so that I know exactly what is going into the food. On that healthy note, I really need to start my day, things to do, and people to see. 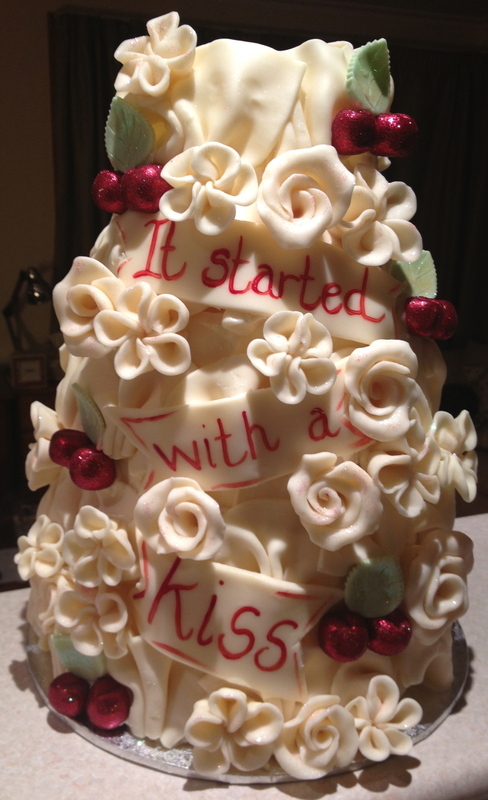 It started with a kiss – 4 tiers of 100% pure white chocolate decorated cake. I’ve decided that as much as I like working with fondant is that I much prefer working with chocolate. My decision is based after making the above cake. 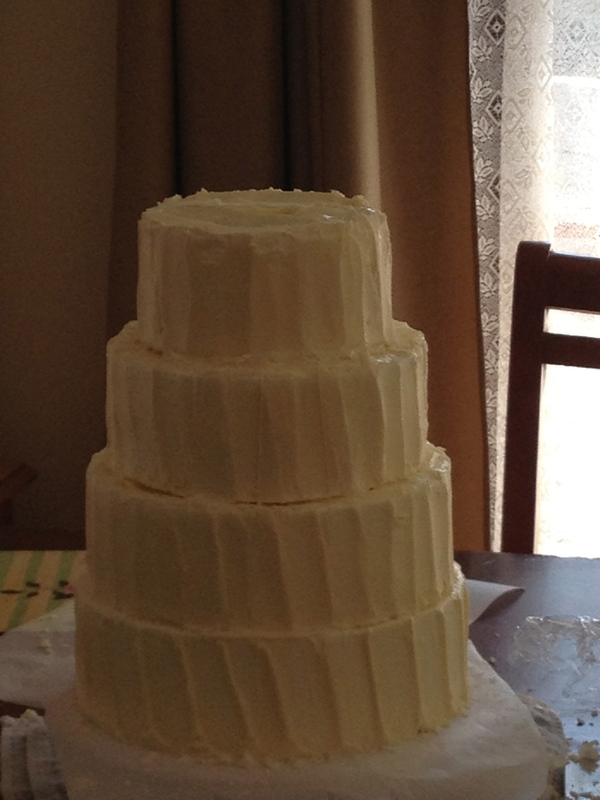 This is 4 tiers tall, and everything you can see on the cake is chocolate and more importantly edible. The whole cake is encased in pure white chocolate, which acts as seal to keep the cake moist underneath. Once I had covered the cake I then went on to make the flowers. I chose roses and chunky looking cherry blossoms. I did make up a batch of pink chocolate to make flowers out of, however once I started to put the flowers on the cake, it just didn’t look right. After making the flowers I made numerous chocolate fans to encircle the cake on each tier, that I would eventually place the flowers, cherries, leaves and banners on. Some people paint the lettering on while the banner is on the cake, maybe one day I’ll do that. However at this stage I prefer doing the lettering while the chocolate is flat on some greaseproof paper. To do the lettering I used a candy colouring gel which is oil based, as the normal colouring pastes are water based and don’t work on chocolate as well. Once all the elements were prepared, I then started to play. First went on the fans, then the banners. Followed by the flowers. Occasionally I would step back for the table and check the cake out from a different perspective, so that I could see what I needed to do next and where to put things. What I love about using chocolate though is just how quick it is to assemble, once all the elements were prepared the cake only took a couple of hours to complete. And Mr Hollipops says there is less washing up when I use chocolate than when I use fondant. My favourite part of the this has to be the cherries. Fun to make, fun to look at and fun to eat. In saying that I don’t (apart from chocolate) have a particular sweet tooth and rarely eat my own cakes. 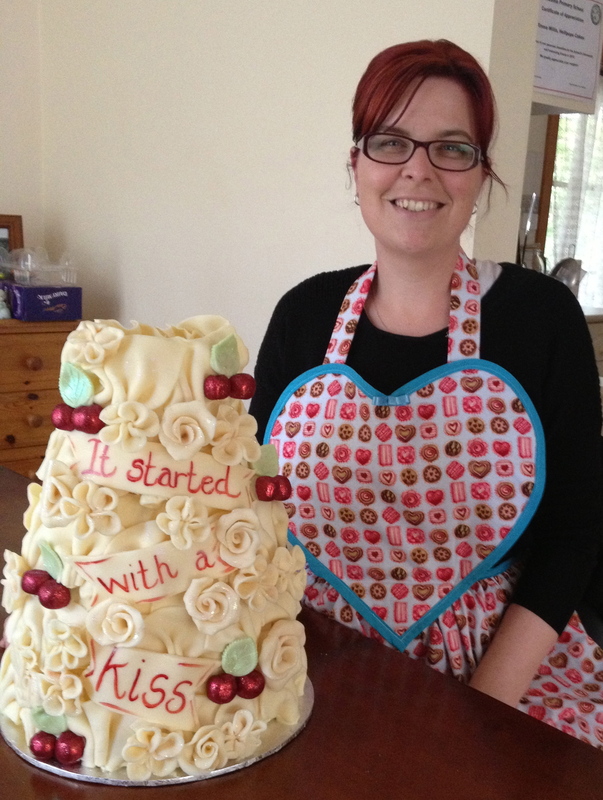 This cake has had the most positive attention from all the cakes I’ve done, it has done very well on Facebook. I even had a comment from Dan Lepard who is an award-winning baker, host of The Great Australian Bake Off who has said my little cake is beautiful. For those who know me, I don’t usually handle compliments well, and usually brush them off with some sarcastic comment, or joke. In this instance I was genuinely shocked. I didn’t expect it to receive any comments, let alone from a professional baker, so it has made my day. 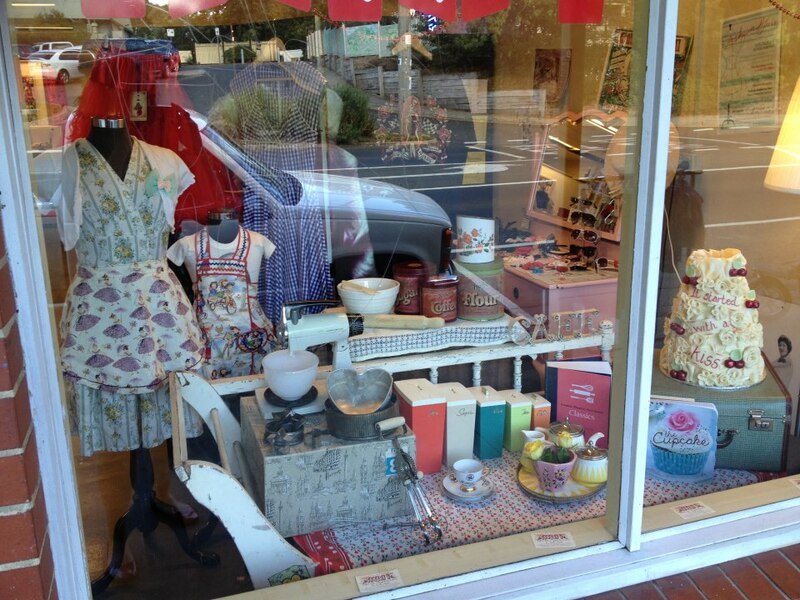 The Cherry cake is displayed at Sandra V’s in Tecoma. Sandra has a 1950’s vintage store, it has so many cool things in there, from shoes, dresses, poodle skirts and much, much more. She recently made me a 50’s type apron (image below), which you can have custom made to your needs. She can also make dresses & skirts. Sandra is a very talented lady when it comes to a needle and thread. The window display is all for our up and coming Mothers Day on the 12th May. So pop along and see if you can grab your Mum something beautiful from Sandra V.
It’s fairly quiet on the cake front for the next few weeks, which is a blessing as I am in training for a 50 kilometre walk – called Go The Extra Mile, which raises awareness for Teen Suicide. Last Sunday myself and my friend walked 42.3K (Marathon distance) our last big walk for our training. We now get to taper down the distances, so this week we’ll walk 25k. Which will give my toes a much-needed break from blisters! In the meantime, I have yet to test drive the BOSCO mixer, so I had better find a really cool recipe and give it a whirl. Looking forward to putting up my review for all to see. I like the fact that BOSCO is Australian owned. My next blog will have the muesli recipe, as I couldn’t find the notepad that I had written the recipe for this blog. Every Mixer Needs A Name, What Should Mine Be Called?? 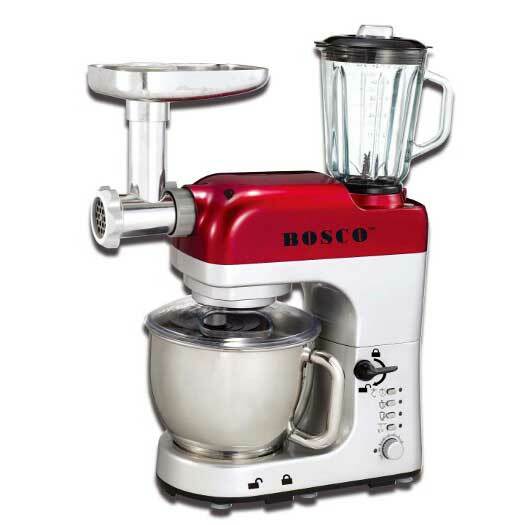 Bosco AS1200HD Multifunction Stand Mixer – image supplied by Bosco Appliances. Above is an image of my new toy, that I am expecting a delivery by the end of business hours tomorrow. My little mixer that I purchased for $49 AUD has done well in the last 18 months, however it is now starting to protest when I start to mix larger quantities. So I have spent my time researching for a replacement. Looking at all the well-known brands and then stumbled across Bosco purely by chance. Integrated suction cups on the base to ensure no movement during operation. One Touch Button Automatic Dough Mixing with auto shut down. Exclusive BOSCO double dough hook design for superior mixing and dough making (similar to commercial machines). Sophisticated Automatic Electronic Controls with manual speed override. Blender, stainless steel bowl and cover are dishwasher safe. Huge money-saving by having multiple appliances all in one. Make delicious healthy meals in minutes. Heavy Duty Metal Construction Design built to last for years. Makes any kitchen bench look modern and hi-tech. After sale support even outside warranty period. 1.5 L heavy duty glass design blender– with super strong stainless steel blades rotating at 19,000 RPM. Crushes ice in seconds. Can process hot/cold ingredients. Blends fruits/vegetables to completely homogenised consistency. 0.25 L mini grinder – perfect for grinding coffee beans/nuts/herbs/spices or fruits/vegetables. Perfect attachment to make baby food. Professional mincer with sausage making accessories – including 3 size dies (fine, medium and coarse) to grind fresh mince in seconds. Also includes kebbeh making attachment. Set of pasta extruder dies – including angel hair, spaghetti, fettuccine, rigatoni. Cookie extruder attachment tool for 4 different types of cookie extrusions. 6 litre stainless steel bowl with handle. Operating instructions and quick reference guide. To say I’m excited to test drive this would be an understatement!! I will be putting my review up on this blog in the next couple of days. As well as adding a link to Bosco Appliances. The cost of the mixer is $439 AUD. Which is an amazing price, considering what you get for your money and considering the cost of other well-known brands, and that is before you start to add all the attachments. So every great mixer needs a name, and I need help to find a name for this beasty. I would love to hear your suggestions. Change of subject now, in the next week I have to make a cake to be professionally photographed to be put in a full-page ad for Melbourne Wedding & Bride Magazine. Which is an amazing opportunity. I wasn’t sure if I wanted to do it at first, and was thankful that I even got a phone call, when I know there are much better cake people out there than me. However I have decided to take a chance and go for it. So I am currently trying to work out what cake design I want to do. I know that it will be chocolate as that is really the direction that I want to go in. And I can see cherry’s on the cake, big beautiful cherries, but that is as far as I’ve got. Definitely a work in progress. I will obviously put the cake up on the blog once I have finished. In fact I have to make 2 cakes as there is another ad in the same magazine, but this time I have to take the photo and add the words. No idea what I’m going to write! Or for that matter what cake design is going to be either. Deadline is on the 22nd April, so really need to be sitting down and working it out. I will also be tweaking the blog. I am wanting to add food that is more than just cake. In the last 6 months or so I have started to make my own cleaning products, and starting to make our own breakfast muesli and bread. I want to become more self-sufficient, so to speak. So I will be sharing, advice, tips, recipes and much more as I continue this journey. And I will be adding links that follow this same path. On a personal note, Mr Hollipops is loving the muesli!! He has already gone through one container and is currently going through the 2nd container! 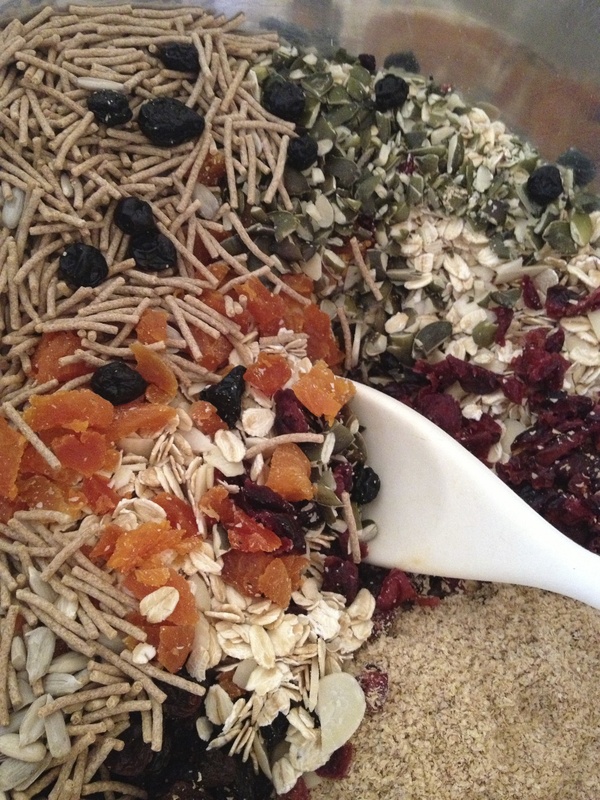 On the next blog I will add the muesli recipe and photos, as well as the Bosco Stand Mixer review. Keeping busy as always!